Travelling with pets in India – Read all that you want to know about travelling with pets in India. Learn about transportation, accommodation, and caretaking etc. Last week one of my friend from Canada asked me about the risks in visiting India with her pet dog. Even though I have travelled a lot in the country and have seen many people with pets in the tourist destinations in India, I never really paid attention to the risks in travelling with a pet. I wanted to help my friend and tried to find information from various official tourism websites but sadly there was nothing much on those sites about the pet policies. I spoke to a few travel guides and also met a couple from Germany who brought their pet dog to India. Let me share what I learnt about travelling with pets in India. Most of the pet loving people face a problem while travelling to national as well as international destinations. They don't know whether the places they are going to travel, permit the pets too or not. Also, they don't know which hotels allow pets and which don't. Though this problem is not a big one in the foreign nations where it is very much usual for tourists to travel with their pets; in India, the situation is a bit different. Hence, it is very important for all the travellers to check all the things before travelling to India with their pets. 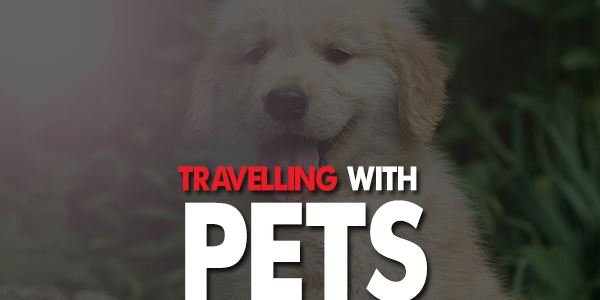 The very first thing to check while travelling with your pets is transportation. Some flights have serious restrictions and rules regarding pet transportation, transporting them on sedation etc. Before you book your tickets, confirm these rules and the other facilities such as the on-air vet etc. The size and condition of the enclosures also play a major role in guaranteeing that your pet travels safe and you are not disturbed for itty-bitty issues during travel. The security clearance and quarantines etc should also be checked before the bookings are done. Once you have landed in India, you need to check the accommodation first and then get refreshed for your tour in the most colourful place on the earth. A lot of hotels, resorts, homestays and lodges etc allow the pets along with the tourists; but some don't allow the pets. You can also search for the pet-friendly hotels in India over the internet which will be a great help. Because having the rooms booked before you reach is better. Almost all the major tourist destinations in India have pet-friendly hotels. Comparing the rents, facilities, reviews and other things will make you sure about the place you have chosen. Some hotels allow the visitors to let the pets stay in the same room but some have different policies and have a separate place for the pets. Further, the size of the pets, their habits and food requirements, climate sensitivity and allergies are some other parameters which must be considered before finalising the stay. A lot of tourist places in India don't allow the tourists to roam around with their pets. Some of them have special places for leaving the pets till the visitors complete their tour. This way you will not worry about your pet all the time as you have it right outside the tourist attraction and can check on it whenever you feel inclined to do so. This also saves you from the ripping hotel charges to look after your pet in your absence. Alternatively, you can leave the pets at the hotels along with the instructions for their feeding or medication or any other specific details for the caretaking staff. The reputed hotels have professionally trained staff to look after your pet while you are gone. They tend to have a variety of pet foods, clean the pet area well and have certificates too for their services. In the cases of medical emergencies, they have professional vets to look after your pet as well as inform you if only if your involvement is necessary. This way, you can stay assured that your lovely pet is in good hands while you enjoy your tour as much as possible. Another way to travel along with your pet is to hire some help from known sources, make an ID check on them. You can travel with your pet and get help to the tourist attraction and while you roam the place, the help can watch over your pet at that time. All the feeding, caretaking and cleaning for the pet can be done by your pet help. There is just a little tip, however; you should treat your pet help as help only and not your servant. This would ensure that the pet help treats your pet as their own and respect your touring sentiments in the best possible manner. Pet Visas are a must. Check all the documents before you plan your trip so that no last-minute cancellations are required. Get your pet vaccinated, treated or medically checked completely before you travel. This will make sure that you don't have to return without completing your trip just because your pet was sick or got quarantined. You must know and understand that the pet quarantine is a very big issue as there are dozens of diseases which spread from pets and are deadly or can assume the epidemic status. Hence, it is of utmost importance that all such formalities are done and dusted. Take common medications, and toys etc which are personal favourites of your pets so that they don't feel bored all the time while you are travelling. Ensuring the pet safety is a must. Especially when you are in a foreign land. Hence, you should check the reviews, make personal calls and even chat with the managers of your accommodation before you book it for you and your pet. You have to be sure that your pet is in a healthy state before you start your travel. Also, you should make sure that the environment and climate of India are well suited to your pet so that it can adapt to the change. Just for the sake of making your luggage small, you just can't ignore the fact that the pet foods, their nature, prices and every other thing will vary from your native place. Hence, you have to make sure that you carry enough pet food for your pet. This will also make sure that your pet doesn't develop any illness owing to change in the food items. Similar to the pet food, the pet medications also change from place to place and you should make sure that you travel with the basic medication for your pets while travelling. The medications, as well as the medical standards in India, are way different from the foreign countries. Hence, having an extra supply will always be good. India is a crowded place and in some of the tourist places, the crowd can get very big. Hence, the pets which are sensitive to crowd and heat should be brought after careful speculation and should be transported in an AC vehicle. Do hotels in India allow pets? The domestic travellers in India do not usually take their pets on their vacation. Due to the high cost and risks involved in bringing pets from abroad, most foreign tourists also avoid pets while visiting India. Due to lack of demand, not many hotels have a clear pet policy in place. So, while booking a hotel, it's better you make a phone call to the hotel and ask if they allow pets. Also, if they allow you to bring pets, it's better you get the confirmation through an email since the person who answered you over the phone may not be there when you reach the hotel with your pet and the manager in charge may have no clue about their pet policy. Expedia.co.in now allows you to search for hotels that allow pets. Just search for hotels in your destination and then click on the "Show more" button in the filter options. It will show the "Pets allowed" checkbox. It comes with a disclaimer that "conditions apply" which means each hotel may have its own conditions for accommodating pets. TripAdvisor.in also have a similar option. While searching for hotels, click on the "More" link to see the "Pets Allowed" option to search for hotels. Some hotels charge an extra fee for allowing pets. The pet fee is usually not mentioned in the booking or website. So, it's better to check with the hotel regarding the additional fee to bring in the pets. In the case of private airlines like SpiceJet and many others, they allow pets to be carried only as Cargo in the aircraft cargo hold. Many Dog breeds are not allowed due to their aggressive nature. Some airlines will allow pets free of charge if the owner has disabilities. The information about carrying pets should be known to airlines at least 48 hours before travel. This is all we can assist you with. If you want to know more, leave your questions in the comment section, and we will make sure that you get the best and correct answers for them.